So your store is up and running and you're getting orders, but how well is it actually doing? And how can you figure out how to do better? Knowledge is power, and that's where our Analytics app comes in. Before you dig in to your data, decide what interval you want to examine. By default, the app shows you data from the last 30 days. You can change it by pressing the menu and selecting a different interval. Also, be aware that the page shows you when it last updated. To refresh the page, click the circular arrow icon next to the time stamp. To export your orders, press the downward-facing arrow icon (see "How to Export Your Orders" for full instructions). The Performance section is all about the bottom line. It shows you how well your store is converting traffic to sales. It displays gross revenue, revenue by day (line graph), total orders received, and your top product, including units ordered and combined revenue. 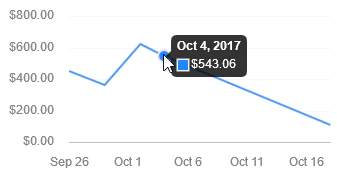 Hover your cursor over the line on the graph to see a daily breakdown of revenue for a particular day. The Traffic section is all about visits. If your store isn't converting particularly well, or if it is and you want to know more about what's working best, you can learn more by examining your total visits, visits by day (line graph), unique visits (doesn't count return visits by the same user), pages viewed per session, average session length, and top device, including percentage of traffic and combined visits (not unique). As in the Performance section, hover your cursor over the line graph to see a daily breakdown of your total visits for a particular day. The Carts section provides information about your conversions. For more information, see "Analytics App: Carts".